Today I'd like to share a card I made using the scrumptious new Made From Scratch collection and the coordinating Designer Dies and Stamps. 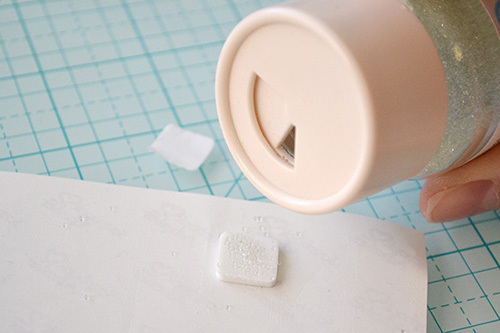 Have I mentioned how much I love using the clear stamps with the matching dies? It saves me so much fussy-cutting time, and I love that I can make my own embellishments in minutes that match the paper collections perfectly. For this card I used the Made From Scratch 6x6 Paper Pad—I love using 6x6 papers for cards so I can save my 12x12 sheets for layouts and other larger projects. Plus the pattern scale fits better with the smaller size of cards. 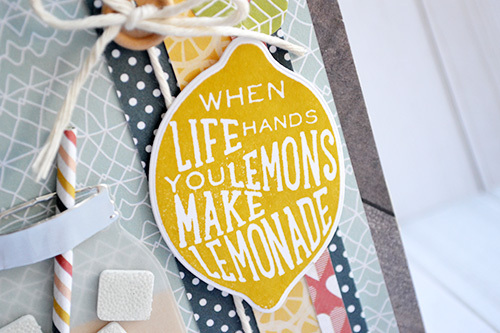 I created my card sentiment with the lemon from the Free Range Designer Die and Stamp Set. I just love the playful font! Then I die cut some leaves using the Lemon Designer Die Set to embellish the top of my lemon sentiment. 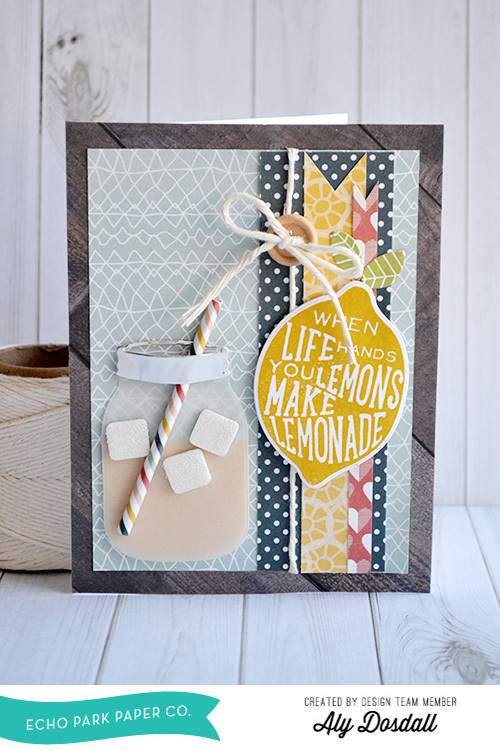 To go along with the sentiment I decided to create a mason jar full of lemonade using the Jar Designer Die. First I die cut a jar shape from yellow paper and trimmed off the top. Next, I die cut a jar shape from vellum, and then a jar lid from metallic silver paper. Then I tightly rolled some striped paper into a small paper straw and inserted it into the lid. Then I assembled the whole jar with the vellum jar piece on top of the yellow jar piece, adding the lid with the straw over the jar layers with foam squares for extra dimension. 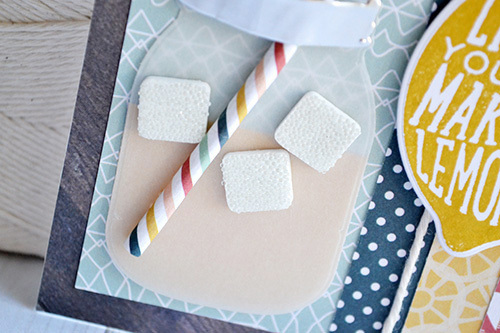 To emphasize the lemonade-in-the-jar theme I created some “ice cubes” by sprinkling clear glass micro beads over the exposed adhesive on some foam squares. Then I lifted the squares off the sheet and placed them inside the jar shape. Try saving yourself some time on your next project by creating custom embellishments with your favorite Designer Dies and Stamps. Creative cheers! Such a cute card! I love it! What machine do you use with these dies? Hi Catherine! I use the Evolution Advanced, but you can use any table top die cutting tool.